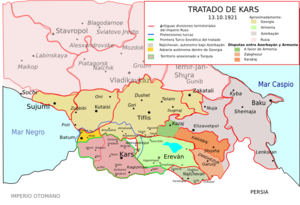 The Treaty of Kars (Turkish: Kars Antlaşması, Russian: Карсский договор / Karskiy dogovor) was a friendship treaty between the Grand National Assembly of Turkey, which in 1923 would declare the Republic of Turkey, and representatives of Soviet Armenia, Soviet Azerbaijan and Soviet Georgia (all of which formed part of the Soviet Union after the December 1922 Union Treaty) with participation of Bolshevist Russia. It was a successor treaty to the earlier Treaty of Moscow of March 1921 and established contemporary borders between Turkey and the South Caucasus states. It was signed in Kars on October 13, 1921 and ratified in Yerevan on September 11, 1922. Most of the territories ceded to Turkey in the treaty were acquired by Imperial Russia from the Ottoman Empire during the Russo-Turkish War of 1877-1878. The only exception was the Surmalu region which was annexed by Russia in the Treaty of Turkmenchay after the last Russo-Persian War with Iran. The treaty was signed by Turkish Nationalist Representative General Kazım Karabekir, MP and Commander of Eastern Front Veli Bey, MP Mouhtar Bey, and Ambassador Memdouh Shevket Bey, Russian Ambassador Yakov Ganetsky, Armenian Minister of Foreign Affairs Askanaz Mravian and Minister of Interior Poghos Makintsian, Azerbaijani Minister of State Control Behboud Shahtahtinsky, and Georgian Minister of Military and Naval Affairs Shalva Eliava and Minister of Foreign Affairs and Financial Affairs Alexander Svanidze. The treaty provided for the territory of the former Russian Batum District of the Kutaisi Governorate to be divided. The northern half, with the port city of Batumi, was ceded by Turkey to the Soviet Union. The southern half, with the city of Artvin, would be annexed by Turkey. It was agreed that the northern half would be granted autonomy within Soviet Georgia. It eventually evolved into the Adjar Autonomous Soviet Socialist Republic (today Adjara). Additionally, Turkey was also guaranteed a "free transit through the port of Batum for commodities and all materials destined for, or originating in, Turkey, without customs duties and charges, and with the right for Turkey to utilize the port of Batum without special charges." The treaty also created a new boundary between Turkey and Soviet Armenia, defined by the Akhurian and Aras Rivers. Turkey obtained from Armenia most of the former Kars Oblast of Russian Empire, including the Surmalu uyezd, with Mount Ararat and the cities of Iğdır and Koghb (Tuzluca), the cities of Kars, Ardahan, and Oltu, the ruins of Ani, and Lake x�ıldır. Most of these areas were already under Turkish military control. The treaty required Turkish troops to withdraw from an area roughly corresponding to the western half of Armenia's present-day Shirak Province (including Alexandropol (Gyumri)). The treaty specified that the region of Nakhchivan (a territory comprising the Nakhchivan and Sharur part of Sharur-Daralagez uyezds of former Erivan Governorate of Russian Empire) was an autonomous territory under the protection of Azerbaijan. In 1924, Nakhchivan Autonomous Soviet Socialist Republic was formed on this territory as an exclave subordinate to Azerbaijan SSR, and sharing a 15-km boundary with now Turkish district of Surmalu. It was also agreed that both Turkey and Russia would become guarantors of Nakhchivan's status. Chicherin and Karakhan tried to annul Alexandropol Treaty, they openly stand on Armenian rights. That is why we decided to outwit them: Mdivani offered a new way. That way supposed direct contact with Stalin, who is the closest friend of Lenin. There two people are the most powerful in Russia. Actually he became the man, who made signing of the Treaty possible. If the issue is solved by Chicherin, who was under influence of Karakhan, supporter of Armenian interests, he would have not done it. ... if not the interfering of Stalin ... Moscow conference would probably last much longer; or we wouldn't get the results we reached. After World War II, the Soviet Union attempted to annul the Kars treaty and regain its lost territory. On June 7, 1945, Soviet Foreign Minister Vyacheslav Molotov told the Turkish ambassador in Moscow that the regions should be returned to the USSR, in the name of both the Georgian and Armenian republics. Turkey found itself in a difficult position: it wanted good relations with the Soviet Union but at the same time they refused to give up the territories. Some British diplomats noted that as early as 1939, Soviet politicians might reopen the question of possibly annulling the Kars treaty. Turkey itself was in no condition to fight a war with the Soviet Union, which had emerged as a superpower after the Second World War. By the autumn of 1945, Soviet troops in the Caucasus were already assembling for a possible invasion of Turkey. Soviet claims were put forth by the Armenians to the leaders of the Allies of World War II; however, opposition stemmed from British leader Winston Churchill who objected to these territorial claims as additional areas where the Soviet government could exert its influence while President of the United States Harry S. Truman, felt that the matter should not concern other parties. Ultimately, the USSR gave up its claims against Turkey. During the crisis, the USSR also asked Turkey for a military base on the Bosphorus. Turkish politicians worked hard, with the help of the British Government, to secure the help of the United States. During this period, the Turkish ambassador to Washington D.C. died and the United States sent his coffin to Istanbul on board the USS Missouri. This was the first large scale American military visit to Turkey and also a symbolic gesture. Only after this event did the USSR back down. Only in the year 1923 the Turkish Republic was announced by the Turkish GNA and the Constitution of the Ottoman Empire was changed with a new one in 1921. There is also an opinion among researchers that as the Soviet Republics were under strict control of Moscow and so the consent and independence of the parties is also questioned. In addition, the USSR itself was established on December 29, 1922. This inflicts the local Communist governments in the Soviet Republics to be legitimate since the same date. Since the dissolution of the Soviet Union in 1991, the governments of Turkey, Georgia, and Azerbaijan have accepted the Kars treaty. But in contrast with this the Armenian position is different. As a prove of that can serve the announcements of Armenian Government officials as well as the absence of any such ratifications or decisions. The Armenian MP Levon Mkrtchyan from ARFD said the issue of recognizing or not recognizing the Kars Treaty is not on Armenia's foreign political agenda in Yerevan on February 3, 2005. He notes that the treaty was signed with gross violations of the international law as it was imposed by the Turkish-Russian Moscow Treaty, which stipulated, that all the South Caucasian republics should later sign similar separate treaties with Turkey. Similarly Armenian Foreign Minister Vartan Oskanyan had argued Armenia accepts the Kars Treaty. However Armenian Declaration of Independence and Armenian Constitution call Turkey's eastern provinces Western Armenia. Armenia does not clearly recognize Turkey's national borders which defined in the Kars Treaty. Additionally, Oskanian noted that Turkey itself does not put a number of articles of the treaty into practice. For instance, the treaty called for Turkey to open a consulate in each of the three Transcaucasian republics. Due to tension between Armenia and Azerbaijan over the region of Nagorno-Karabakh, Turkey has closed the land border with Armenia and severed diplomatic ties with it, thus allegedly violating this article. Oskanyan states that by this action, Turkey is putting the validity of the treaty into doubt.